Australia is a land of mystery and beauty. One of the most ecologically diverse places on the planet, Australia’s beautiful and breathtaking scenery can be the backdrop for your dream vacation. Better still, you can see and do anything you like when you choose completely customized and affordable luxury yacht charter vacations. Bordered by no fewer than three oceans and the Tasman Sea, you will have an endless coastline to explore and adventure on. Red sand deserts, the Great Barrier Reef, and tropical forests, along with their inhabitants, await your discovery. Bush trails and imposing Uluru await you in Alice Springs, the capital of the country’s Red Center. Impossibly red sand and botanic gardens showcase the incredible diversity found here, and beautiful buildings reveal a long and colorful history. If you want to see marine life up close, there’s no better place than the Great Barrier Reef. One of the seven wonders of the world, the reef is vast enough to exceed the Great Wall of China in size. Your chartered yacht includes access to experienced instructors who can teach you how to snorkel and scuba dive like a pro. Prefer an experience on land? It’s easy with a yacht. Smaller yacht charters are able to navigate through narrow channels and get closer to untouched beaches and coves, which you can enjoy from the luxury of your yacht or explore yourself on a hike through a tropical forest. The Whitsundays, 74 islands off the coast of Queensland, are another completely unique experience that can be had with a yacht vacation. Another of the world’s natural wonders, The Whitsundays include vast beaches and your choice of private coves. Your yacht crew is ready to take you wherever you want to go, whenever you wish, and for however long you want to stay. Once your day on the beach is done, you can enjoy a pre-dinner glass of Australian pinot noir or Shiraz from one of several world-renowned wineries in the Hunter Valley, Margaret River, or Barossa Valley. When you vacation on an Australian yacht charter, your vacation can be anything you want it to be, right down to your meals, which are prepared by a professional chef. Any planned activity can be changed according to the weather or your energy level. If you feel like relaxing the day away, just alert your crew and you will be left undisturbed. Australia’s exciting variety of stunning scenery, wildlife, and unique experiences are not to be missed. Chartered yacht cruises offer all the benefits of a hotel and a cruise ship combined. The expert brokers at Yachtstore find you the best crew for your needs and preferences so that you can enjoy an unforgettable vacation. 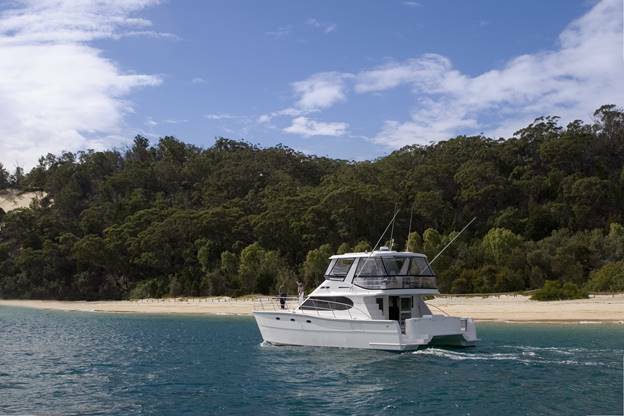 If you’re ready to discover the many benefits of booking a yacht charter to see Australia in all her glory, call Yachtstore today: 1-888-446-4141.